Gutter cleaning is an important part of home maintenance. If you do not keep your gutters clean, they will soon pile up with leaves and other debris that will not allow water to properly drain from your roof. This can lead to a slew of problems, like rotting wood, sagging gutters, pest infestations, and much more. That’s why it’s a good idea to clean out your gutters at least twice a year. Here are five tips that make gutter cleaning quick and easy (although we can’t promise it will be fun!). Gutter guards are essentially caps that go over your gutters to minimise debris pileups. There are small slits in the guards that let water pass through so you can still direct the water where you want it to go. The caps will stop leaves, nuts, branches, and other nuisances from piling up in your guttering. This will minimise the work you have to do later on. If you have relatively new guttering or you plan on installing new gutters in the future, go the extra mile and get some gutter guards for your home. If your gutters are still in good shape structurally, you should be able to power wash them for cleaning. This will require you to get a generator that converts your garden hose into a high-pressure water system. Power washing will save you from having to pull out debris by hand, but it is not wise to try on older gutters that are weak and bent. The pressure from the water may cause the gutters to fall if they are not secured well. If you decide to power wash your gutters, avoid forcing all of the debris down the downspout. Instead, try to push it over the edge of the gutters and onto the grass for you to rake up later. This may seem like more work, but a cluttered downspout can be a big headache to mess with. Try to prevent that if possible. If power washing is not an option or you have too much clutter in your gutters to effectively power wash, you will need to pull out the debris by hand. It would be wise to wear thick work gloves or rubber gloves when you do this in case there are sharp objects or harmful insects in your gutters. Put all of the debris you pull out into a trashcan so you do not have to clean it up from the ground. Once the bulk of the debris is out of your gutters, you should be able to rinse it out with a hose. Watch how the water flows once you put it in there and make sure it comes out of the downspout. If not, you may have to use a small brush on a wire to push out whatever may be clogging the system. Rinsing your gutters will also let you see if there are any areas where the water may pool up rather than draining. If you see that, you may want to replace that section of your guttering because it will cause problems later on. When your gutters are completely clean, you will need to keep up with regular maintenance to minimise the work you have to do each time you clean. Try cleaning once right before autumn and then once right after it. These will be the times when the debris will be most troubling in the gutters. 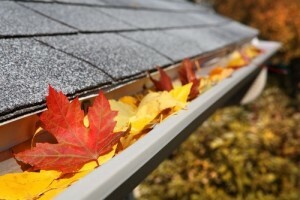 Protect your investment and avoid spending money on new gutters by cleaning and maintaining the ones you already have. If you don’t want to get up on your roof yourself, have a talk to one of the TrustedCleaner gutter cleaning experts; our featured businesses in Sydney and Brisbane would be happy to help you out.